Washington State Department of Transportation - FTS Inc. The Department of Transportation is a Washington State governmental agency that constructs, maintains, and regulates the use of the state’s transportation infrastructure. The Washington State Department of Transportation (WSDOT) is responsible for building, operating and maintaining a huge transportation network that includes almost 20,000 state highway lane-miles, more than 3,000 bridges and 10 major mountain passes. As part of the ongoing commitment to managing the state’s traffic flow, WSDOT is also dedicated to preserving Washington’s environmental quality. Highway run-off can carry significant loads of contaminants such as dissolved metals, pesticides, animal waste, engine oil and other vehicle by-products. Stormwater may wash large volumes of untreated highway pollutants into streams and rivers that can ultimately cause serious problems in salmon-spawning habitats and major watersheds. Stormwater management is a highly complex undertaking. WSDOT is actively developing ongoing best management practices (BMP) which include researching the origins and make-up of pollutants and run off on the state’s roadways and how to effectively manage and treat contaminated water. In addition to BMP’s, WSDOT is required to obtain a municipal National Pollutant Discharge Elimination System (NPDES) permit to monitor runoff from roads and highways in order to be in compliance with federal regulations. WSDOT has deployed 18 FTS cutting edge automated stormwater monitoring stations at various locations throughout Washington State, measuring stormwater run-off from highways, vehicle rest areas and other WSDOT structures/facilities. 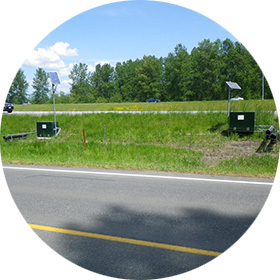 Housed in rugged TTS roadside enclosures, these systems include Axiom H2 Dataloggers and a wide selection of FTS sensors for accurately measuring and transmitting water sample data allowing technicians to easily assess untreated highway run-off. Refrigerated automatic pump samplers are triggered to capture a sample when accumulated rainfall, water level and temperature criteria are met simultaneously. Collected data is sent via GOES telemetry (hourly), and technicians are alerted to the storm event and resulting sample collection so the samples can be collected and sent to a laboratory for analysis. Ultimately, WSDOT will be able to determine the best ways to treat stormwater from those areas where contamination levels are of concern. The collected data also helps in policy decision-making and the active management of highway stormwater run-off.